The Victory motorcycle company is owned by Polaris, an American snowmobile manufacturer. 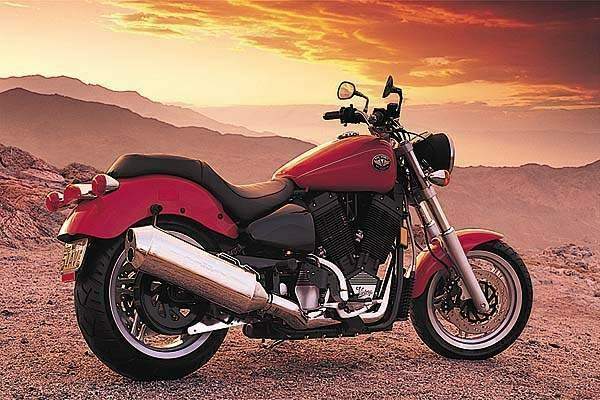 The Sport Cruiser is based on the firm's V92 Cruiser, so it shares the 1507cc fuel-injected V-twin engine of the cruiser, although the SC produces 7.5kW (lObhp) more, thanks to a two-into-one exhaust system. The frame is similar, but the Sport Cruiser has much higher-spec chassis components. The wheels are sportsbike-style 43cm (17in) cast items, fitted with sports radial tyres. Brakes are upgraded with twin discs at the front, and the suspension is also more refined, with massive 50mm (2in) Marzocchi forks and a Fox rear monoshock. Though a satisfying ride, the V92SC has insufficient ground clearance for sportier riding. 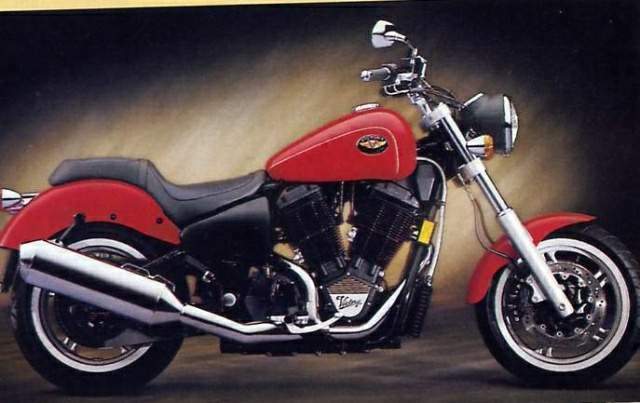 FOR OUTSIDERS LOOKING IN, THE whole Moto Guzzi thing can be likened to the Harley-Davidson mystique. You know, that if-you-have-to-ask business. After all, Guzzi types often exhibit a sense of proud eccentricity, they congregate together in an almost clannish manner, and they keep their bikes for years and years. With the introduction of the new-for-2000 VI1 Jackal, the folks at Moto Guzzi have taken all these customer characteristics into consideration. But they're also treading in some previously uncharted Guzzi territory, as the $8490 Jackal is a bargain-bike. At least, it is by M-G standards. Explains an official Guzzi guy: "We're trying to attract new Guzzi owners by making a lower-priced version of our product. And we are also trying to get the traditional Guzzi rider who hasn't bought a new bike in a while." In spite of the Jackal's minimalist styling, it's actually a parts-bin bike. At its most basic, the machine borrows the chassis and 1064cc fuel-injected V-Twin from the VI1 Bassa (CW, September), while adopting stripped-down bodywork from the V11 EV (CW, March, 1998). And when we say the Jackal is stripped-down, we mean stripped-down. Cost-cutting measures include a single disc brake up front, a simplified instrument cluster sans tach and dispensing with all the superfluous chrome found on the EV. The Jackal also uses Borrani steel rims with tube-type tires, as opposed to the Bassa's aluminum wheels that accept tubeless rubber. In spite of its parsimonious parts patrimony, the Jackal looks and feels far from cheap. Stroll around the bike, and its bulbous tank complements the industrial styling. Climb aboard, thumb the starter button and blip the throttle. The sideways-mounted engine shudders almost violently, and lets loose with a full-on back-of-the-throat roar. Fortunately, the Guzzi's bark is as good as its bite. Lashed down to the CW dyno, it made 62 rear-wheel horsepower at 5700 rpm, and 59 footpounds of torque at 4800 rpm. No wall-flower here. But, could the Jackal run with the big dogs? On our favorite set of twisties, we happily found the answer to be "yes." With a relatively aggressive seating position, the easy-steering machine slinks in and out of ess turns, while sweepers are an exercise in smoothness. Beware of rippled pavement, though, where the overly stiff dual rear shocks can inspire "moments." In tighter going, the Jackal's non-linked Brembo brakes slow the 439-pound bike more than competently. And as for the five-speed transmission, let's just say that it engages with a satisfying clunk. Our biggest complaint about the Jackal occurs at higher speeds. Not that the bike can't handle it; the CW radar gun clocked the Guzzi at a respectable 119 mph. The problem is the seating position. It's too upright for freeway use, and puts too much pressure on the tailbone. And did we mention wind-blast? A screen is one of the many accessories Moto Guzzi makes for the Jackal. Buy one. Now. Overall, though, the Jackal is everything Moto Guzzi had hoped, appealing to the elite Guzzi crowd while remaining cost-effective. A sportbike? No. But a sporting cruiser? Most definitely.